In interior decorating there are Natural Lines in an Environment that direct your eye both Horizontally and Vertically around a room. When adding decorative elements (pictures, mirrors or other kinds of wall decor) to your space, you want to line up your decorative elements, with the room’s natural lines, so your eye moves smoothly from one thing to another, without moving up or down too much. Look at Illustration 1. 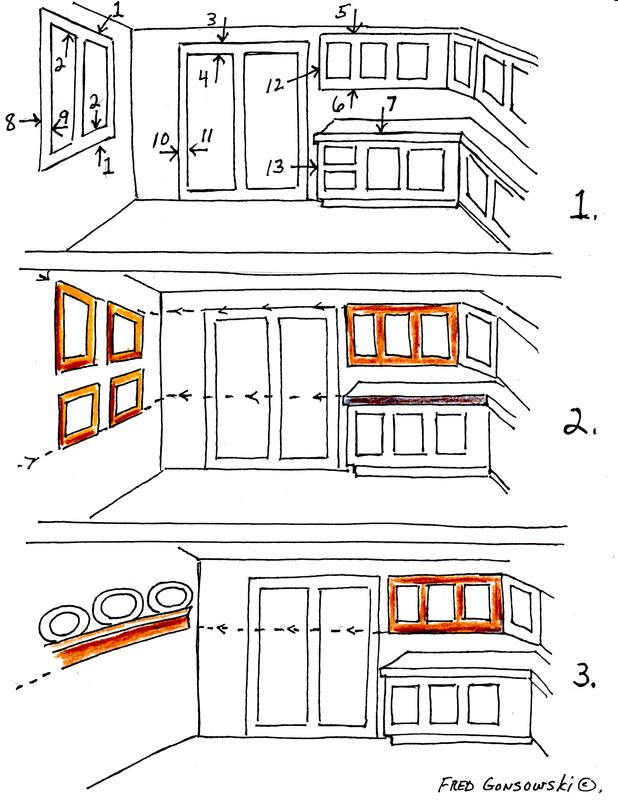 The natural horizontal lines in this illustration are created by both the top and bottom edges of the molding that surrounds the window frame on the left side of the drawing #1 and #2. The next set of natural lines are created by the top and bottom edges of the molding running across the top of the sliding door #3 and #4. The third grouping of horizontal lines are the top and bottom edges of the upper cabinets #5 and #6, and #7 the top edge of the counter top. The natural Vertical lines in this space are created by both the outside and inside edges of the molding surrounding the window #8 and #9, the outside and inside edges of the vertical molding around the sliding door #10 and #11, and the vertical side edges of both the top and base cabinets #12 and #13. Now that you know what natural lines are, you want to use them in interior decorating. Next look at Illustration 2. Notice how the grouping of four pictures lines up with the top edge of the upper cabinet and top edge of the counter top. The natural lines extend from one wall to another at exactly the same level. In Illustration 3, notice how the bottom edge of the plate rack lines up with the bottom edge of the upper cabinet. Sometimes you don’t want to line up edges based on architectural elements (doors and windows). You want to create your own set of new lines. Illustration 4 shows how the top edges of all the framed wall decor line up with each other. Illustration 5 shows a more complicated version of Illustration 4. Following the dotted lines, notice how some of the top edges, and some of the bottom edges of the pictures line up with each other. Not everyone has an octagonal room like Illustration 6. 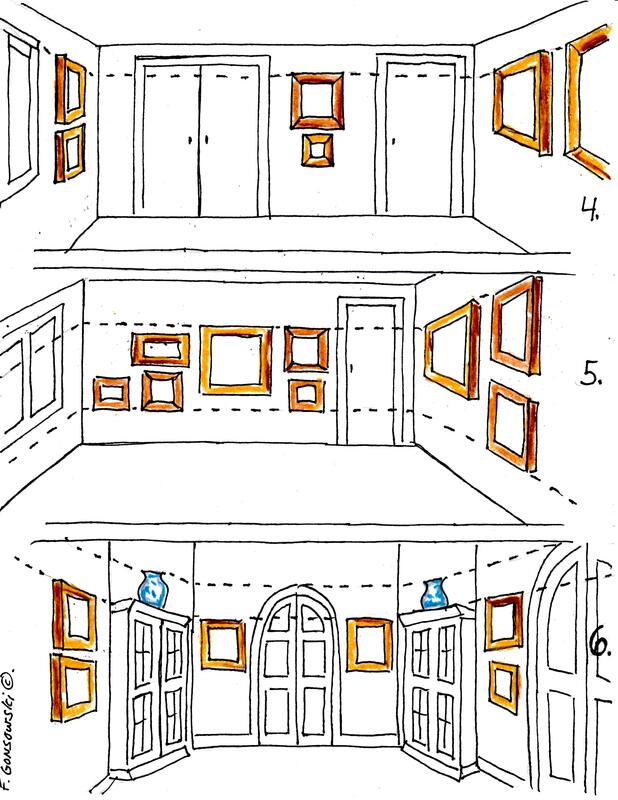 In this drawing the dotted lines show how the artwork and decorative accessories line up with the molding around the grand doorways, and the horizontal top lines, created by the tall book cases. So now after reading the FOUR Posts, that I have written on hanging pictures, I hope you see how easy is it to hang wall decor. It really is a snap, once you know a few simple decorating secrets. Happy Picture Hanging! I’m seeking some guidance in applying this information to hanging wall art in bedrooms. I (hopefully correctly) presume that the “eight-inch rule” for hanging items over a couch or table also applies to hanging items over a chest of drawers in a bedroom. (Does anyone say “highboy” anymore?) If this is correct, then I am primarily wondering about items hung over a bed and about alignment of artwork around the entire bedroom. Regarding items hung over a bed: on one hand, there are different height headboards; on the other, there are beds without a headboard. Furthermore, people sometimes sit up in bed (with or without a freestanding, upholstered bed rest); so, even without a tangible headboard, it seems that one needs to allow room for an “imaginary headboard,” so to speak, so that any wall hangings would clear the head of anyone who might sit up in the bed. Regarding alignment of artwork around the entire bedroom: perhaps one starts with the top edge of the highest artwork, whether eight inches above the “highboy” or above a real or imagined headboard, and then uses the other rule of aligning all the other top edges with the highest one. I suppose the height of the dresser mirror must come into play here as well; perhaps it creates another possible level of alignment. Then, of course, the natural lines created by the architectural elements of the room are yet another possibility. Please help us sort/evaluate/prioritize these various considerations for hanging wall art in bedrooms. If there are any other tips that would be specifically helpful in bedroom décor, we would appreciate your sharing those as well. Thank you, for your always prompt specific responses, and for your attractive and helpful site in general. In finding your site, I’ve found a gem. When placing a bed in a bedroom space/place it at least 6 inches away from the wall, so if wall art falls, it will fall behind the bed not on you. Never hang anything with glass or anything with sharp edges, that if it fell could hurt anyone in bed. When hanging things over a bed, use larger hangers than recommended. If something weighs five pounds, use a ten to fifteen pound hook. The nail will be longer and there is less of a chance that the thing will fall. Bedroom furniture is mostly bed side tables, double or triple dressers, and chests-of-drawers. A high boy is a chest up on legs. Most highboys are from the time of George Washington. Rich people, back in the day, most likely had a highboy. The highboy has Queen Anne styled legs, though you see French furniture up on fancy carved and gilded legs. Did you read my post It’s Easy to Decorate a Room with Tall / High Ceilings, it talks about vertical tension, Interior Decorating is all about Equal Balance is another. I would say the 8 inches applies to dressers and chests, but as for beds with no headboards, low headboards, etc, practicality versus rules on design should be thought of first. I say make paper templates of you artworks and tape them up with painters tape then step back and see if you like how it looks. Move things up and down until you see them at a height you like. If the shapes look off, they could be the wrong size for the space above the bed. Lining up things by the top of the door, mirror over the dresser, etc are all right options, the choice is yours. I think if you line up things on three walls in the room, and the artwork over the bed does not follow, so what. There will be continuity of movement around most of the walls. Hope I helped you a bit, I know the purpose of my blog is working, as it got you thinking about possibilities. I just LOVE your comment Mona and Token, you are just what I needed tonight to put a smile on my face. You know those so called professionals were in it for the $$$, and I’m glad you got your inspiration here for free. Look at all the decorating topics I’ve written; they are located under Categories on the right side of the screen. Interior Decorating Principles is where you will find them. Look at the end of the first page, for older posts, it’s really small, and click on that and you will see more posts. Have the most wonderful of Summers, and come back again, as I still have many interior decorating articles to write, when I am done working on my garden. Hi there Camfuse, and aha moment, makes me thing of Soulful Sundays on Oprah’s OWN network, Loving It!